How Business Angels Make You Succeed? Our primary aim is to let entrepreneurs become self sustaining and in this process they can use the services of a start up incubator and startup accelerator. Who is a business angel? Wikipedia defines angel investor or angel (also known as a business angel or informal investor or angel funder) as an affluent individual who provides capital for a business startup, usually in exchange for convertible debt or ownership equity. In short: If you need a little more money than just the seed capital you generated, you need to assure your lenders that they have nothing to lose, on paper! 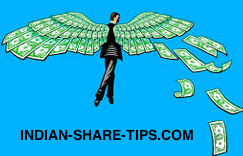 Subscribe for free share market tips and make daily money with our intraday tip and relax by 11:30 AM with profit.